Perhaps the oldest domesticated flower and still the favorite cut flower around the world, roses can droop and drop their petals quickly if they are not handled correctly. A popular gift for Mother’s Day and other holidays, bouquets can be ordered to be delivered across state and national borders. It’s wise to inspect your gift closely. Bouquets that become dehydrated will wilt quickly and lose both their petals and the pleasure they were meant to give. With just a few simple precautions, rose bouquets can last more than a week, says Master Consulting Rosarian Kitty Belendez. Inspect flowers as soon as they arrive. Dry leaves, soft stems or limp petals are all signs of dehydration. If extensive, the flowers should be returned. If you want to try to revive them, plunge them immediately into a tall container filled with water to just below the flowers or buds. Trim a quarter inch off the bottom of the stems at a 50-degree angle. Cut them underwater or in the stream of water from your tap to prevent bubbles from blocking the cells and preventing water intake. Leave them in a cool, dark room or wrapped in plastic in your refrigerator for several hours. Inspect them. The stems and petals should be firm. Remove any dried leaves or other debris and arrange the flowers in a vase of fresh water. Place them away from the direct sun or drafts, preferably in a cool spot with indirect light. Watch for bud or flower droop. If the stem becomes weak just below the flower, it is too late for that rose as a long stemmed cut flower, but you can still enjoy the bloom. Cut the stem an inch below the bud or flower and float it in a bud vase. Cut roses in the early morning when they are full of moisture. If you cut later in the day, they will droop because of the heat and partial dehydration. 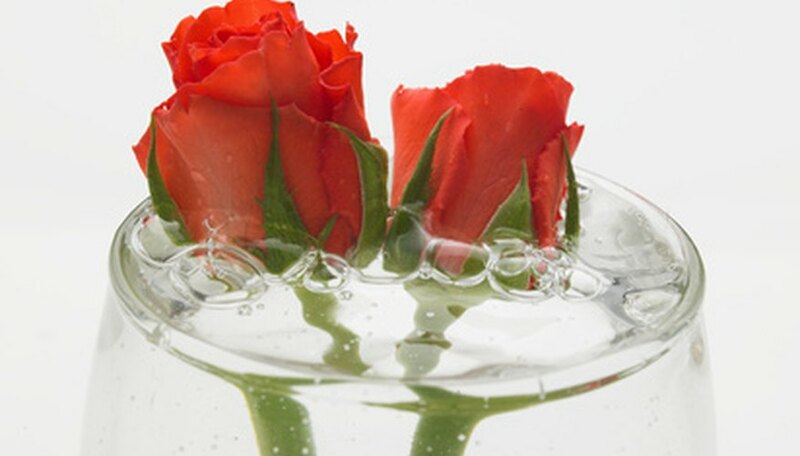 Revive roses by plunging stems in water. Wrap in plastic and store the roses in your refrigerator for a few hours to harden them off after being cut. Place wilted roses in a container of lukewarm water, cover it and put it in a cool, dark room for several hours. Arrange your bouquet after the roses have absorbed a maximum of water. Keep the bottom of their stems cut at a 50-degree angle daily so the cells can absorb water. If you allow them to dry out, immerse immediately in water up to the flowers for several hours. Prevent droop by changing the water daily to remove decaying foliage and any bacteria that could attack the roses. Revive roses drooping in stagnant water by replacing it with fresh water and removing all dead foliage to keep bacteria from attacking other roses.